Landlords of the earth, indeed gone. Barns the world over are one of the greatest architectural vernacular expressions. They have had historic roots as great instruments of storage for countless centuries – the placement of both farm crops and stabling of farm stock within their walls. Barns can be deeply appreciated for their great beauty and purity of form. They may be regarded as special windows of opportunity in unraveling secrets of the agrarian past. They also reflect how rural folk lived their independent and determined lives. In barns of whatever ethnic origin there may be seen great levels of skill that was manifested by ancient timber framers and masons. Barns are constructed of great timbers that came from trees in primeval forests that once covered North America. Barns were made to endure for generations. Eastern Barn Consultants has for the past thirty five years been dedicated to the interpretation and documentation of North American barns. Often the structure and stylistic expressions seen in many barns are of an unknown and obscure nature but through the close examinations of more than 3,500 barns of all different types EBC has been able to discern what certain ethnic influences there may be found in any particular barn. An invaluable and much sought after part of various documentation methodologies is the determination of dates of construction to within only a few years of the actual date of building. 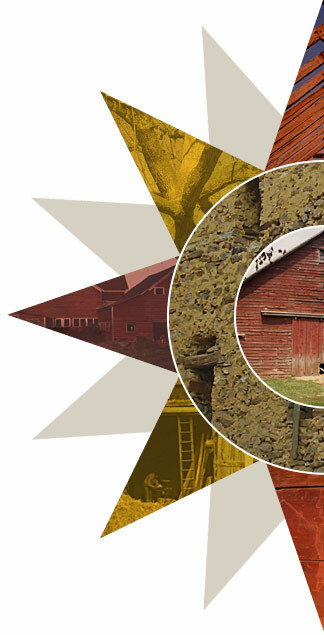 In the process, permanent Barn History reports are created for current and future generations. Copyright © Greg Huber. Web Design: Norm Christiansen.